Note: Chrysler dealerships ordering upfit packages should contact Geno's Garage directly at (800) 755-1715 or (770) 886-2500 to order. On March 25, 2014, Cummins commemorated the 25th Anniversary of its Turbo Diesel engine in the Ram Heavy Duty Truck lineup by releasing an upfit package for model year 2014 heavy duty pickups. The Cummins Turbo Diesel was first available in a Ram Pickup truck for model year 1989 and continues to be offered in today's Ram Heavy Duty Pickups and Chassis Cabs. With this 25th Anniversary package, 2014 Ram HD truck owners will be able to transform their truck into a unique 25th anniversary truck with custom badges, floormats, red breather cover, receiver hitch cover and a Katzkin leather interior. Step 2. If you order online, a representative of Geno's Garage will contact you directly to confirm order details, color selection, upgrades, etc. If an order is placed in the evening or over the weekend, the purchaser will be contacted on the next business day. Step 3. A written order confirmation will be provided to the purchaser to verify all details are correct. Step 4. After the order confirmation has been approved, the customer will be charged, and production of the custom leather interior will begin. Please note that because the custom leather interiors are made specifically for your truck, all items will be shipped to a local authorized Katzkin installer. Your installer will install the entire package for you. Congratulations on your new truck and on being one of the first to upfit your 2014 Ram. Color Option 1: Black Wrap, Black Insert, Silver Stitching, White Logo. 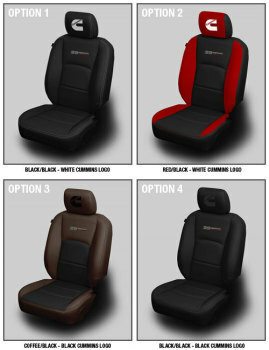 Color Option 2: Black Wrap, Crimson Red Wings, Red Stitching, White Logo. Color Option 3: Coffee Wrap, Black Insert, Black Stitching, Black Logo. Color Option 4: Black Wrap, Black Insert, Black Stitching, Black Logo.